Special offers on FOUR new books. Interpreting Medieval Effigies: The Evidence from Yorkshire to 1400 is Brian and Moira Gittos’s long-awaited study of the wealth of evidence provided by the monumental effigies of Yorkshire, from the thirteenth and fourteenth centuries, including some of very high sculptural merit. 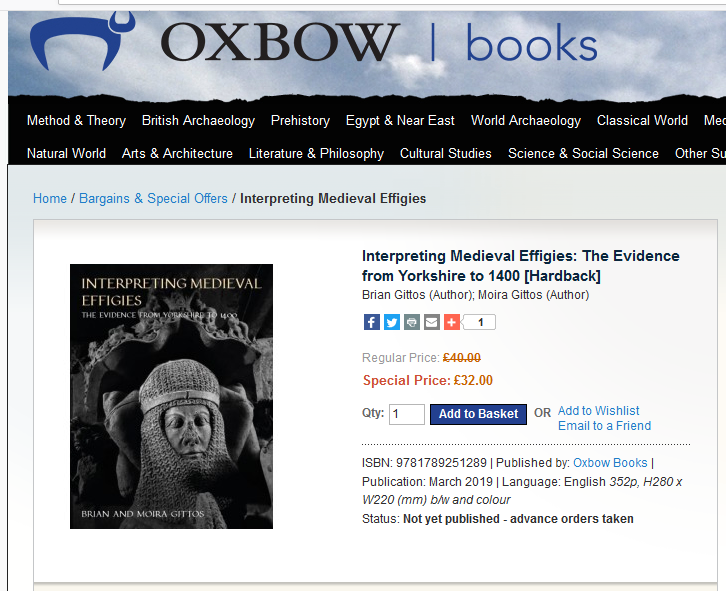 More detail at https://www.oxbowbooks.com/oxbow/interpreting-medieval-effigies.html. Memorializing the Middle Classes in Medieval and Renaissance Europe investigates commemorative practices in Cyprus, Flanders, France, Germany, Italy, Poland, and Spain between the twelfth and seventeenth centuries. Click on the links below for details and order forms.